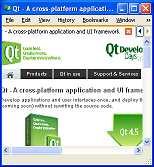 This page discusses various available options for working with HTML documents in your Qt application. Please also read the general considerations outlined in the Handling Document Formats article. Qt's Scribe framework (see Handling Document Formats) has built-in support for loading from / saving to HTML (see QTextDocument::setHtml and toHtml as well as QTextDocumentWriter). Together with the format-independent API that QTextDocument provides for modifying documents (or creating them from scratch), this makes Scribe an adequate framework for processing or generating HTML documents. However, it only supports a limited subset of static HTML 4 / CSS 2.1 - corresponding to the limited set of built-in document features which QTextDocument supports internally. The Webkit-based web browser framework shipped with Qt provides the QWebPage and QWebFrame classes, which can be used to load an HTML document (or any web page) without actually rendering it, and access or modify it through a DOM-like API. Saving back to HTML is possible using QWebFrame::toHtml. If your application needs to parse or write HTML/XHTML documents which are valid XML, consider processing them using Qt's XML handling classes (see Handling Document Formats). …render it onto any QPaintDevice using QTextDocument::drawContents. …show it to the user through a QTextEdit widget (either in read-only mode, or in editable mode which allows the user to actually edit the document interactively). Again, the restriction to the limited subset of static HTML 4 / CSS 2.1 supported by QTextDocument applies. The framework also allows rendering an HTML page to any QPaintDevice using QWebFrame::render. This page was last modified on 27 June 2015, at 21:24.